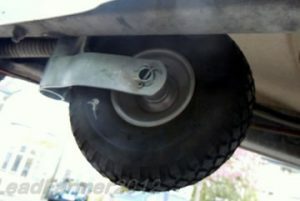 I recently noticed that the AL-KO jockey wheel on my 2004 Swift Challenger had chunks missing from it, probably caused by using the caravan mover over harsh terrain, or perhaps whilst the jockey wheel was still fully retracted within its upper shaft and preventing the wheel from turning? 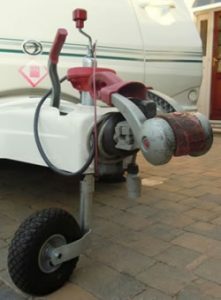 Seeing as I store my caravan on a farm that has very hard uneven ground, I thought that a pneumatic jockey wheel would make it much easier to manoeuvre the van when operating the mover. I first considered whether I could just swap the wheel rather than having to buy a complete new unit, but eventually decided to replace the whole thing. So after seeking advice form Caravan Talk members I set about swapping my jockey wheel. Please read the last section ‘Potential problems’ before deciding if a pneumatic jockey wheel is right for you. The following photos weren’t all necessarily taken at the time I changed mine, but they do act as a guide. Firstly, if you just wish to replace the actual wheel rather than the whole assembly, then first check the following (as shown in the two photos below). 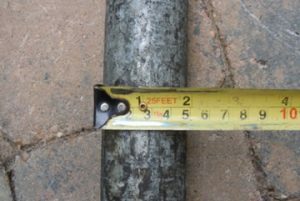 Measure the distance between the forks of your existing jockey wheel, as a pneumatic wheel may be wider than your current wheel. Check underneath your a-frame to see if a wider pneumatic wheel will locate correctly when the jockey wheel is fully lifted for towing. When refitting with your pneumatic wheel, it may be worth re-fitting a new split pin at the same time. The photo above was taken after I started to tap out the split pin, as you can see it has caused it to deform slightly. Perhaps an ‘R’ clip might be a better option? So off I trundled to my nearest parts supplier and purchased a suitable AL-KO jockey wheel for £39. There are two ways to remove your jockey wheel. 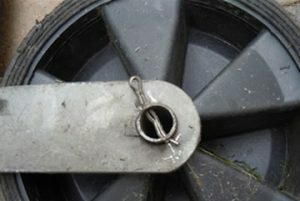 If you are lucky (as I was) then you will find that after releasing the jockey wheel clamp, the whole assembly can be lowered through the hole in the a-frame (a little jiggery-pokery may be needed to feed the handle through). You may find that you have to raise the a-frame a little higher to give sufficient ground clearance for the jockey wheel and handle to be passed through the hole. 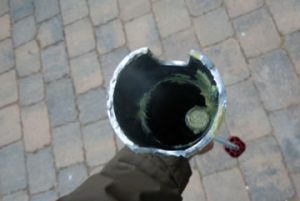 As you can see from the photo below, the jockey wheel is greased internally, so wearing a pair of disposable latex gloves is recommended before handling. The two photos above and below show the two separate halves of my new jockey wheel once the handle has been fully unwound. You can see that the upper half has a threaded rod then simply threads into the lower half, it’s as simple as that. You may lucky enough to find that your new jockey wheel will feed up (handle first) as a complete unit through you’re a-frame hole. Unfortunately mine wouldn’t, so I had to separate the two halves of my new jockey wheel by fully unwinding the handle (see above). I lowered the upper half down into the a-frame hole and secured it in place with the clamp. Then, from below I slid the lower half up, and into the upper half. Whilst holding it in place I slowly wound the handle until I felt the threaded rod bite into the lower half, then I kept winding the handle until it was positioned as needed. 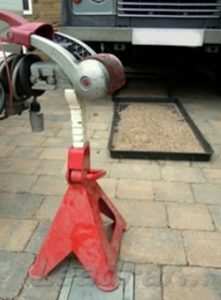 Ensuring the clamp handle was tightly engaged, I lifted the front of my caravan by its hitch and removed the axel stand, before gently lowering the caravan back to the ground. Again, get someone to help with lifting the front of your caravan if required. 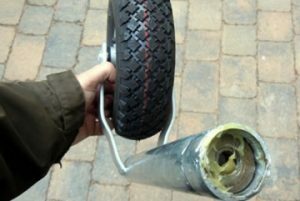 With the pneumatic wheel now taking the weight of my caravan I noticed the tyre looked a little low of pressure, so I pumped a little air into it using my Joe Blow bicycle pump. Some Caravan Talk members have informed me that they have sometimes found their pneumatic jockey wheel tyres have deflated whilst the van is in store. 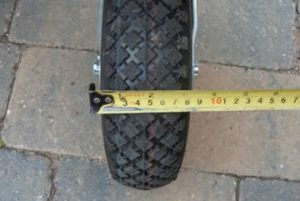 To frustrate things further, some have found that it is difficult to attach a pump onto their tyre valve due to restricted space between the valve and the wheel forks, requiring them to have a different inner tube fitted that incorporates an angled valve. I guess only time will tell as to whether I suffer with similar tyre deflation problems. However, as far as pumping up my tyre goes, I have found that the tyre valve on my AL-KO jockey wheel easily pulls away from the wheel, allowing me to attach my ‘Joe Blow’ bicycle pump onto it. So far so good!